From the paper presented at the symposium on the Design of Small Mass Produced Car Engines in November 1963, and presented to the Scottish branch of the Mechanical Engineers (Automobile Division) in Glasgow on Monday, January 20, 1964. The all-aluminium Hillman Imp engine developed from the Coventry Climax design was one of the design features of 1963. The bulk of the development work on this engine was carried out by the three Rootes leading engineers named above. Peter Ware is a director and chief executive engineer of Humber Ltd, while Leo Kuzmicki and A. Craig Miller are both chief engineers with Humber. In this first part of a two-part series they cover the basic essentials and the requirements of design. They move on to the design and planning of the cylinder block and timing cover and in the next part we will continue with the cylinder head and valve gear and piston assembly and finally the faults which became apparent and their cure. After prolonged and thorough economic, technical and market research investigations the Rootes Group decided to introduce a small rear-engined car. We have no intention of entering into a discussion concerning the merits of the above conception, but we would mention that many complex problems had to be solved before a satisfactory solution was reached. There is no doubt that the location of the engine at the rear influenced the selection of a light alloy engine. Consideration of machining and thermal aspects were two other important parameters. After physical dimensions and the intended performance were settled, normal design investigations began. In accordance with general accepted practice a number of small engines were studied and their merits examined. One of those more closely studied was the 750cc Coventry Climax engine. Analysis showed that many features coincided with Rootes' requirements. Long-standing good relations between our respective companies enabled us to secure extremely valuable advice and help us and we would like here to record acknowledgement for the help we received from Coventry Climax. The time allocated for design and development was relatively short and Rootes Engineering had the difficult task of not only designing and developing an engine in the allocated time, but also providing information for the Planning Department concerned with planning and building a completely new modern plant which embodied the maximum automation permitted by economic considerations. Not only a machining plant but foundries had to be planned and built. Two types of diecasting process are used: low pressure and high pressure. The decision to produce the cylinder block by a low pressure method was mainly based on the technical and economic flexibility of the low pressure method. Maximum metal feeding pressure in the low pressure system does not exceed 16psi and in consequence the die could be made form inexpensive, more readily machinable material, a fact which greatly assists during the empirical phase of development. At the same time it must be realised that the low pressure technique is slower than the high pressure method and more casting units are required to maintain the intended production, but the initial cost is far lower. The high pressure system which employs high injection pressure requires high quality steel to be used for the die manufacture. The Imp aluminium engine is probably the first mass-produced engine of its kind and production technique considerations strongly influenced many aspects of the design. The closest possible co-operation between Planning and Engineering was constantly maintained during the whole design and development period, because it was very clear that only by this process would it be possible to produce economically a modem light-alloy engine. Greater flexibility in rating offered by a liquid-cooled system. The intended car performance was a base for establishing the capacity of the engine. The Engineering Department developed a very convenient method for power estimation which proved to give extremely close approximation to actual performance. The method is based on the original work done in the USA and employs as a main parameter the average coefficient of discharge 'C' obtained by the well-known method of steady flow measurements and the derivative parameter of gulp factor. The success of prediction very largely depends on the correct selection of certain assumed values which are unavoidable at this stage. After the initial port and valve design is completed a wooden model is made and flow tests under steady flow conditions are carried out to establish the best 'C' valve. Special attention is paid to port regions which have a predominant influence on air flow. One of the most critical regions is where the port core is located in the combustion chamber; misalignment here can and does produce quite different values of 'C' and consequently significant difference in the power output. It is very important that during work on the inlet port parallel work should be conducted on the induction manifold, the overal1 coefficient of discharge which is used in power prediction being the resultant of the port and manifold. Once the optimum 'C' is established an empirical method of prediction is applied. Early work in the USA had shown correlation between volumetric efficiency and the gulp factor. Close study of the above relation and consideration of valve timing, assumed inlet and exhaust pressures result in the indicated horsepower estimation. The mechanical friction losses will have to be assumed to obtain the bhp curve. Needless to say, it is most useful and economically very attractive to be able to examine by this prediction method any change made in valve size, shape or timing, port shape etc. before actual physical alteration is made. It should be understood that accuracy of prediction decreases with the increase of valve overlap or the presence of strongly pulsating exhaust, or deliberate ramming effect, with the inlet manifold. Having established the valve size, investigation was concentrated on combustion chamber design. At this stage it was decided that the general conception of the engine would be that of a single overhead camshaft with directly operated valves. Apart from purely kinetic, dynamic and mechanical considerations, the above method of valve operation seems to be the logical owing to the use of aluminium with its high expansion coefficient and the possible adverse effects if a pushrod operating mechanism were used. Rootes Engineering Department have tested single overhead camshaft engines (large capacity) with finger operated valve mechanism and the results proved the superiority of the directly operated valves. The type of combustion chamber was established taking into consideration the following two main factors - thermal and production. The wedge-type combustion chamber offers very good surface-to-volume ratio, which, in conjunction with suitably selected turbulence, would enable an engine to have relatively low octane requirements, bearing in mind that the intended normal compression ratio is 10 to 1. In fact it was established that the Imp engine can be run safely on fuel of 95 octane. Production considerations demanded that, to keep the cost down, the valve should be in-line and the general outline shape should be such that a single traversing tool would produce a fully machined combustion chamber with minimum volume variations between cylinders to ensure smoothness of engine operation. To provide necessary and valuable compression turbulence a squish of 29.3% is provided. It must be understood that at this stage the number of cylinders is known and the general dimensions are the logical outcome of a complex inter-relation of mechanic and thermal factors. Apart from the availability of space allocated for the engine, serious consideration is given to length (bore holes) and height. The connecting-rod length to crank throw ratio which settles the point of maximum piston speed has a bearing on the engine's breathing ability. Generally it is easier to design a cam within low limits of acceleration if the ratio is numerically high. At the same time, inter-relationship between connecting-rod to throw ratio and compression turbulence in the last part of the stroke is rather complex, but presents a fascinating study. Inlet valve head diameter: 1.064"
The original intention was to produce a cylinder block by high pressure diecast method and a design study was made on those lines. The cost of aluminium and the necessity to comply with requirements of the high pressure diecast technique forces their designer to adopt a special approach. The mechanical strength must be achieved by careful consideration of structural shape. Casting considerations are more predominant than if the sand-cast method is used. It is imperative that loose cores are absent, so in consequence no undercuts can be used. To achieve full advantage from high pressure diecasting, consultation and co-operation with the Diecasters and Production Planning Departments must be constantly maintained, and very often thc whole conception must be revised to coincide with economic production requirements. It probably would be of interest to list a few dimensional tolerances which could and should be achieved if the full advantages of diecast process is to be realised. At this point it should be stated that tolerance problems in the diecast produced part are complicated by the existence of moving part of die or parting line. Uniformity of tolerances is unobtainable. Machining allowances for the block casting used in the Imp engine would be 0.020" to 0.030". The ultimate thickness which will be used is a function of the production method. This is reflected mainly in the accurate casting of the jig location pads in relation to vital dimensions such as cylinder bore centres. The linear dimensions tolerances as cast are of the order of 0.004", plus an additional increase of 0.0015" for length. An additional increase in tolerance will also be due to the location of the parting line of the die. As far as the walls are concerned a draft or taper must be used and the actual valve depends on the depth and the part of the die. Flatness tolerance will be of approximately 0.008" with additional increase for larger dimensions. Most of the holes could be cored and of course draught requirements are dependent upon depth. The high pressure die manufacturers claim (and sometimes achieve) a standard of coring holes to tapping dimensions, but we feel that it is only possible in special cases where location pads are machined rather than cast. It is impracticable to give here the full range of tolerances, but there is no doubt that the production advantages achieved from a properly designed diecast component are very substantial. Although, as has been said, the cylinder block was designed for high pressure process, the transformation to low pressure process was relatively easy from a dimensional point of view. A certain increase in machining allowances was necessary but the general principles are very similar. The main problem arose during the process of casting. The difference in pressure used and the corresponding variation in the velocity of die filling, superimposed on different temperature distribution, demanded some redesigning, mainly to provide more easy metal flow to avoid possible porosity and early solidification. The opencored top deck construction ensures clear coolant passage. The aluminium cylinder head has wedge-shaped combustion with chrome-iron valve seats. The cylinder liners are centrifugally cast in iron. A considerable amount of research and development went into the problem of cylinder liner outside form. The final finish which was selected is a fully machined liner having circumferential grooves. This sort of finish provides good keying properties and ensures good heat transfer. The resultant conception is a well-balanced compromise between production aspects and cost, without any sacrifice of performance. The cylinder liners are pre-heated to 400ºF. before they are placed in the die. The cast-in liners are machined to the final bore diameter in accordance with normally accepted bore finish of 23'35 micro inches. The oil gallery tube is made in aluminium and was introduced to obviate the necessity for drilling. It must be said that the presence of the above tube complicated the casting process and a few modifications were necessary to obtain a satisfactory solution. It probably would be more advantageous to use steel tube but owing to the necessity for cross drilling it was considered less attractive. Again, to eliminate any possible porosity round the cast-in tube, it was necessary to introduce an additional feed. The allocation of space for the engine made it necessary to 'Siamese' 1-2 and 3-4 bores, but adequate coolant circulation all round and the high conductivity of aluminium ensure that possible bore distortion does not exist. The cylinder block is extended below the centre-line of the bearings and this ensures very rigid construction. All three main bearings caps are high pressure diecast in LM24. It has often been said that aluminium expansion would alter bearing running clearances with a consequent increase in noise. Our experience has proved that the use of these caps is quite satisfactory. All tappings are done directly in the aluminium and Helicoil inserts are used only for salvage operations. The timing cover which is designed in accordance with high pressure diecast principles had all holes cored to maximum diameter, but during the pilot production run it was found necessary to reduce the diameter of some of the cored holes. The second modification was to add webs to strengthen the engine mounting bracket (integral with timing cover) because of early failure during tests on the pavé. The cylinder head is produced by the gravity die-cast method with sand cores for ports and water space. The close cylinder bore spacing presented a challenge to the designer to accommodate the required port sizes and the inlet and exhaust ports are on the same side with the ports arranged alternately to ensure even temperature distribution and to minimise distortion. The valve spacing allows for a generous amount of material between valve inserts, a consideration which pays good dividends when high thermal loads are present and the top deck of the cylinder head provided a platform for bolting of the camshaft and tappet carrier. The tappet carrier is produced in LM24 alloy and an open-cast channel on the bottom face of the tappet carrier provides an oil gallery for tappet and bearing lubrication when bolted on the to of the cylinder head. Chilled cast-iron tappets run directly in aluminium bores. Owing to the compactness of the cylinder head, ingenuity had to be used to provide adequate water passages and to obviate steam pockets. The wedge combustion chambers are fully machined for reasons previously stated. The cylinder head is fixed to the cylinder block by 10 bolts tightened to 35-37 lb. ft. torque. The predominant factor during the design process was ease of production from both the machining and casting points of view. The valve gear consists of: camshaft, tappets, adjusting shims and valves. In the original design double valve springs were used but later the inner springs were removed as it was found that the valve gear operated satisfactorily with a single spring. The engine is capable of running at much higher speeds than normally recommended (6,000rpm), the present spring arrangement being valve bounce-free up to 7,400rpm. At the same time, valve size proportions make it unnecessary in driving to run any higher than 6,000rpm. Piston-type tappets are directly operated by the camshaft with generated profile cams and the surface stress level is quite conservative. The tappets are flat and altogether the cams are not offset, tappet rotation does take place. The valve running clearances are adjusted by means of graduated shims and once correctly set-in the setting does not alter. A thin walled bush is pressed into the small-end. It is important for assembly of the bush to providc a shallow chamfer to avoid shearing of the steel backing. The crankshaft is a conventional three-bearing, four-throw steel forging and the comparatively short throw resuts in a substantial overlap. The front and rear webs are 0.657" thick, while the two centre webs are 0.586". Axial thrust is taken in each direction by two tin-flashed, copper-lead, steel-backed half-washers at the centre. A machined oil scroll provides the seal at the rear and runs in a housing formed by the cylinder block and main bearing cap. Four drilled holes which break out on the leading side of the pins deliver oil from the mains to the big-ends. All the crankshafts are statically and dynamically balanced. The crankshaft assembly, including the flywheel and starter ring assembly, and the clutch assembly are dynamically balanced to O.50 in. oz. The weight of the finished shaft is 25.25 lb., approximately one sixth of the total engine weight. Fatigue tests have shown that the Imp crankshaft had an adequate margin for further development and tests on reference stress of 10 tons per sq. in. resulted in life up to 50,000,000 cycles. All balance webs are machined at maximum radius to provide clearance for piston skirt at BDC. The connecting rod is an H-section steel forging with the cap face split at 40° so that rod can be easily withdrawn upwards through the cylinder bore. The big-end joint face is serrated to relieve the bolts of shear stress. The bearing housing is bored on assembly. Serrations were adopted in preference to tongue-and-groove location to facilitate production manufacture and eliminate interference fit on assembly. For a high-output engine with compression ratio of 10:1 a solid-skirt piston was preferred; the pislon is form-ground giving skirt clearance of 0.0008" at the bottom and 0.0017" at the top. The piston is an LO-EX aluminium die-casting and is of a compact design; a rigid crown and gudgeon pin boss are joined by two webs forming a light but strong unit. A full-floating gudgeon pin is provided to give good piston alignment and offset to reduce noise. There are two compression rings and one scraper ring situated above the gudgeon pin; to give increased bore life the top ring is chromium plated to a depth of 0.003" to 0.005". The second ring has a step in the inside of the upper surface so that blow-by gas causes the ring to twist, forming a tapered ring. The scraper ring has a narrow band with large capacity slots between them for the passage of oil to ten holes drilled radially in the scraper groove; the design gives extreme lightness which reduces inertia and minimises ring groove wear. The cooling is provided by centrifugal pump, radiator and fan. A thermostat is provided for more rapid warm-up. The location of the engine at the rear forced us to develop an efficient cooling fan. Two problems had to be overcome; first, providing sufficient air for radiator cooling and, secondly, keeping fan noise to an acceptable level. Unfortunately, these two factors are contradictory. In the very early stages of development it was decided to produce the cooling fan and cowl in plastic. Polypropylene was selected for its stability, strength and resistance to corrosion. The need to introduce inlet guide vanes was realised very soon, when air flow distribution was measured. Work on the efficiency and acoustic development was lengthy but in the end satisfactory results were obtained. The proximity of fan rotor blades to the guide vanes proved to be a very important factor in the reduction of noise level but the determinations of the system resistance had to be carried out on the road. To assess the mechanical strength, over-speeding tests were carried out. Normally the fan runs at engine speed, but during development the fan was run at up to 12,000rpm in normal temperature and for 24 hours at 6,000rpm in air heated up to 50°C . In both cases no failure occurred. These and other tests proved that polypropylene is a suitable material for fan production. The first four prototype engines were built using castings produced by sand-cast method and the cylinder block had pressed-in liners. It should be noted here that castings were produced from die-cast drawings and the foundry managed to produce castings with only small increase in thickness. 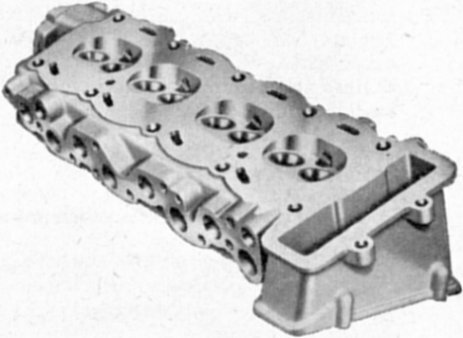 The cylinder head produced with sand cores gave very close approximation to the intended gravity die-cast cylinder head. Ports checked for air flow needed very small adjustments to achieve the coefficient of discharge used in performance prediction. The sand die-cast manifold used in the original prototype was the source of somc embarrassment, because the main collector gallery and branches were cast without draught angle. When tested for air flow in conjunction with the cylinder head, the resultant coefficient was quite satisfactory - probably slightly on the high side. The die-cast manifold proved to be inadequate and a rather costly modification to the die was necessary. The above instance very clearly brought home the fact that when using die-cast components a very careful check and extensive tests are advisable before the die is made. The first prototype run on the testbed proved that the engine was capable of delivering power in accordance with prediction and no mechanical failure was experienced. As soon as the cylinder block was ready, additional prototypes were built. Development was complicated by the fact that a new type of proprietary carburettor had to be developed in parallel. The absence of a die-cast manifold at this stage further complicated the matter, the settings achieved on the sand-cast manifold were not suitable for a die-cast manifold. 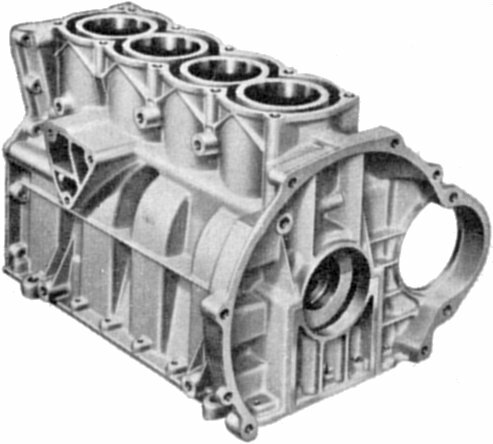 At an early stage it became apparent that the first die-cast cylinder blocks were suffering from porosity in the area of the rear main bearing. Extensive X-ray examination was applied and certain concessions for the manufacturing process had to be introduced. The water jacket depth was reduced by 0.125" to provide additional metal flow area, and an increase in metal thickness around the cast-in oil gallery tube was found to be necessary. Apart from many small modifications, the problem of porosity was finally eliminated by the addition of a second feed in the region of the rear main bearing. The only structural weakness which became apparent during testing were cracks on the front main bearing membrane originating from the bearing cap tenon. These weaknesses were rectified by the introduction of additional webs in this area and an increase in the chamfer in the tenon. The cycling test of 1,000 hours in the early stages of development was satisfactorily concluded. When the stripped engine was examined, the general condition of the components was found to be most satisfactory. Parallel with testbed development, road-tests and rig-tests were conducted. Very early on it became apparent that oil consumption was above acceptable limits. Many theories were advanced and the piston profile and various combinations of piston rings were examined. Cycling tests were run for many hours with alternative assemblies and the combination of piston and ring development. Introduction of inlet valve guide seals finally solved the problem. The cylinder head gasket problem occupied a considerable amount of time. Extensive investigation into cylinder head bolt loading and washer thickness proved very instructive. Gaskets of many different types and materials were tested before a suitable combination was found. The valve gear development did not present any difficulty from a mechanical point of view. The tappets lubricated by bearing spillage, but it very soon became obvious that this was inadequate. The introduction of what could be called 'weirs' for the retention of oil was quite satisfactory from a lubrication point of view, but presented a production problem. The final solution was found by drilling holes from the camshaft carrier oil gallery to the tappets, the holes being uncovered by the tappet at the valve open point. Drilling was introduced on three tappet bores only, which, with existing bearing spillage, solved the problem. To summarise we would like to say that generally the development process of the aluminium engine is very similar to that of a cast-iron engine. We hope this short description of the Imp engine will give an inside look into the process of thinking and the cumulative approach adopted by Rootes Engineering. At the same time we would like to add a few more brief observations concerning problems associated with the aluminium engine. The high coefficient of expansion - a characteristic of aluminium - presents problems for the Inspection Department. For example, the main-bearing housings, which are machined to a high accuracy, must be gauged at a pre-determined temperature. When the die-cast aluminium component is designed, careful consideration should be given to the method of clamping for machining. Also, the force exerted by cutting tools should be accounted for, especially because the stiffness obtained through the utilisation of shape is not always capable of resisting the load applied during machining processes. The configuration of the cylinder head and valve disposition allows for a considerable increase in valve size and consequent improvement in performance. A certain increase in valve lift is possible, and higher rpm could easily be obtained. The engine was checked for torsional vibration at higher-than-operational rpm and found to be satisfactory. Finally we would like to say that in the light of our early experiences the choice of aluminium for the engine was right. We believe that as we accumulate more operational data, this rightness of decision will become clearly apparent. Leo Kuzmicki had once been chief engine designer with Vanwall, the F1 team.